I was chatting with a fellow passenger on the train from Barmouth. He owned a holiday letting business. He was telling me he had spent the day scanning in paper invoices from cleaners in order to then post all the originals to the property owners. Poor you I thought, how backward, I thought surely your time is better spent marketing your properties. So I suggested to him he encouraged his cleaners to use SliQ Online. Out pops my iPad , thanks Arriva Trains Wales for the free wifi, and I gave him an on the train training demo of the software. Excellent he said. He hadn’t realised how simple to set up it was. And for £6 a month his cleaners would then email everything to him and cc the owners and he saves all that time. No brainer he said. So if you have a business you can’t get out of raising invoices and the least amount of time you spend on it the less painful and costly it is. Your customers are happy because they know what they owe. If they lose your invoice you can easily send them a copy. Try out SliQ Invoicing Online at https://www.invoicing-software.com/. SliQ Invoicing works on Windows 10 as well as all earlier non-server versions of Windows from XP, through Vista, Windows 7, 8 and 8.1. If you are taking up the offer of a free upgrade to Windows 10 from Microsoft and downloading Windows 10, during installation choose the option to keep your applications and personal data. We haven’t experienced any problems so far upgrading any of our PCs to Windows 10 with the exception that one of our older printers no longer worked. As no default printer was then selected in Windows 10, SliQ was unable to do a print or a print preview. If this is the case, go into Windows Settings and set a default printer. SliQ will then print and do a print preview OK. You can access Windows 10 Settings by clicking the new Start button at the bottom left of the screen and choosing Settings then accessing the Device and Printer settings option. Download Windows Essentials 2012. Essentials includes a number of programs including Writer and Messenger. If you only want to download the Mail program follow the instructions after the download starts to choose the specific programs you want. After completing the download and installation, follow the instructions at this link – How to make Windows Live Mail the default email program in Windows. Windows Live Mail will then be set as the default email program allowing programs such as SliQ Invoicing Lite and Plus to send invoices by email. 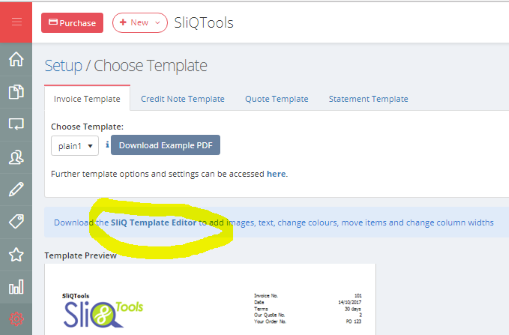 Version 5 of SliQ Invoicing Plus has been released. This is a major new version of SliQ Invoicing Plus and is released almost two years after V4. Over 100 additions and modifications have been included in version 5 based on feedback from customers. The top user-requested features included in V5 are a built-in spellchecker when editing invoices and a stock control system for tracking stock level and helping automate raising orders for low stock items. V5 now also includes the ability to define HTML email templates, allowing users to add logos and formatted signatures to emails sent from SliQ, e.g. when emailing invoices to customers. A number of smaller features have been added to increase flexibility, e.g. it is now possible to automatically insert date information into line item descriptions on recurring invoices. In V5 it is also possible to configure the date ranges used on ageing reports on statements to bring them in line with invoice payment terms if desired. Existing customers can upgrade from any earlier version of SliQ Invoicing at the reduced upgrade price shown on our sales page. Any purchaser of V5 will be able to download any updated V5 release, e.g. 5.1, 5.2 etc. will be free updates for those who have already bought V5. To find out more about the changes in V5, see our Release History page. There are many ways to capture a screenshot, save the captured image to disk and then attach it to an email. Some versions of Windows come with built-in image capture tools such as the Snipping Tool in Windows 7. Another alternative is to use SliQ Screen Capture. This is a free, very simple tool from SliQTools that provides easy options for capturing screenshots of your complete desktop, the current application running in Windows or even a control within an application. By default, when a screenshot is captured, SliQ Screen Capture opens the captured image in Microsoft Paint. In later versions, Microsoft Paint includes a Send in e-mail option that quickly allows you attach the image to an email. 2. Run SliQ Screen Capture. SliQ Screen Capture always sits on top of all other windows. You can still work with other applications but SliQ Screen Capture stays visible so you can click on one of its capture image buttons. 3. Click on the window of which you want take an image. For example, if you want to take a screenshot of a window in SliQ Invoicing, click on the window in SliQ Invoicing Plus with your mouse. 4. In SliQ Screen Capture, press the Capture Foreground Window button. The button is highlighted with a red square in the following picture. Then wait for Microsoft Paint to launch. 5. 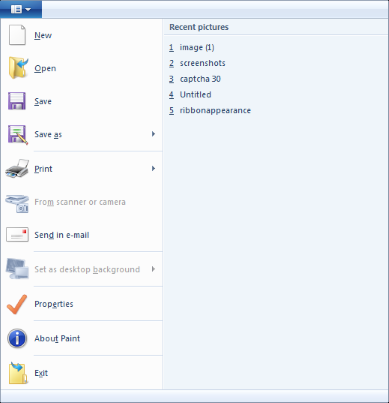 In Microsoft Paint, open the File menu and choose the Send in email option. A new email window should then open with the captured image attached. 6. Edit the email as normal – enter the email address you want to send the picture to, the subject and email message – and press the Send button to send the email. 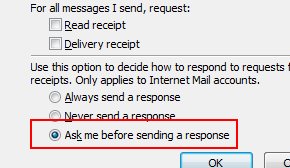 Microsoft Outlook allows you to configure options for how read receipt requests are handled. When you receive an email for which the sender has requested a read receipt you can configure Outlook to ignore the read receipt request, always automatically send a read receipt or ask you email by email whether to respond with a receipt or not. To configure the read receipt options, choose the Options option in the Tools menu. The, in the Outlook Options dialog, choose the Email Options … button near the top of the Preferences tab. In the Options dialog, then press the Tracking Options … button. Finally, in the Tracking Options dialog, choose the desired option before pressing the OK button. For more Outlook tips, see Configuring the Default Email Account in Microsoft Outlook. Coming back to one of my WordPress blogs at the weekend I had a nasty surprise. 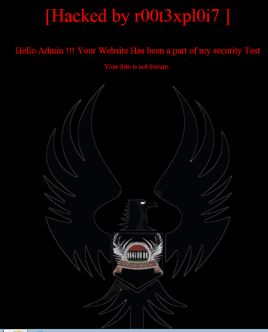 The website was showing the page below indicating that the site had been hacked. To try and see how this could have happened, I attempted to log into the wordpress admin account by going to the URL: www dot mydomain dot com/wp-admin/. What was really surprising was that I could not log in as admin even though the correct WordPress login page was still visible in the wp-admin subfolder. Fortunately, I was able to log in to the cPanel for the site through the hosting company’s main website and using the File Manager in cPanel, I began to look for any suspicious files or changes. As I was unable to log in to the WordPress site, I knew I also had to check the passwords in the WordPress MySQL database. I then went back to the WordPress login page on my site (www dot mydomain dot com/wp-admin/) and clicked the Forgot password link and followed the instructions to set a new password. To be on the safe side I set a very strong password. Having done that I could then login OK to the WordPress control panel. However at this point, the website was still showing the hacked page. Going back to File Manager in cPanel and looking through the PHP files, I found that the index.php of the WordPress theme (in the wp-content/themes/theme name/ folder had a very recent modified date. Opening up the index.php for viewing showed that the file had been overwritten and now contained PHP to show the hacked page. Unhacking the site was then easy – I logged into the WordPress control panel and switched themes – the site was then back fully functioning. To be on the safe side, I deleted the hacked theme in the WordPress control panel. At this point I’m assuming the hack was due to a weakness in the PHP for the WordPress theme as the password was pretty obscure. However, I’ll be monitoring the WordPress blog to see if the site goes down again.